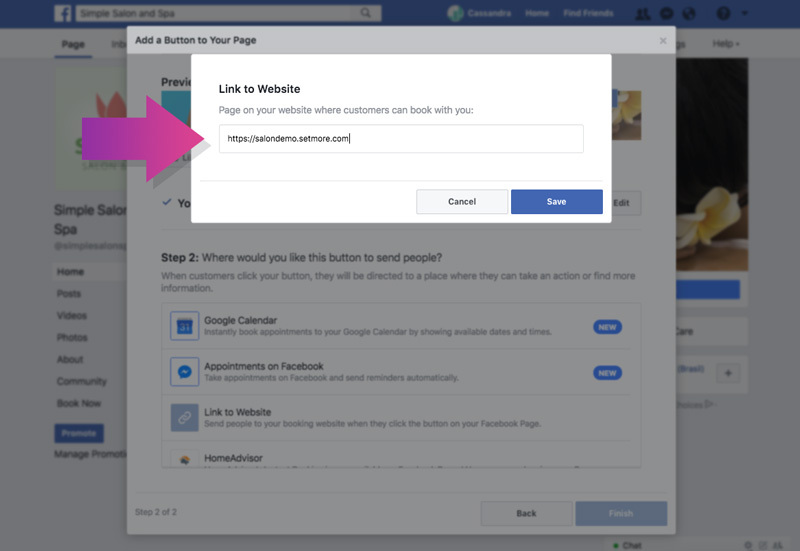 There are two methods at your disposal for adding Setmore to Facebook: you may install the Setmore plugin for Facebook, or you may add a "Book Now" button that links to your Setmore Booking Page. For best results, we recommend doing both methods. Note that the Setmore plugin for Facebook cannot be installed via the Facebook mobile app, but you can still add the "Book Now" button from the mobile app. For maximum ease and convenience, it's best to do the install from a desktop or laptop computer. Don't have a Facebook business page? Learn more about Facebook business pages here. 1. On your Facebook business page, click or tap the "+ Add a Button" button, beneath and to the right of your header image. 2. You'll be prompted to specify the type of button you want to add. Select "Book Now" from the list of available options. 3. Under "Select Booking Tool," choose "Link to Website." 4. Next enter the URL for your Setmore Booking Page. You can find this URL by navigating to Apps & Integrations in your Setmore account, and clicking the "Configure" button below Your Booking Page. After you paste the URL in the form field, click or tap Create or Save. 5. Now test the button by clicking on it and selecting "Test Button" from the dropdown menu. Your Booking Page should open in a new tab. 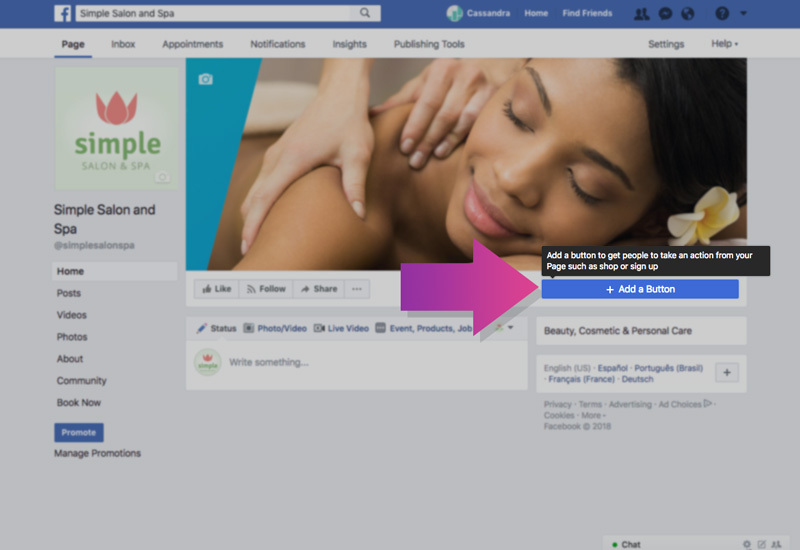 The "Book Now" button will appear on your business page when viewed through the Facebook mobile app, and will open your Booking Page in a new browser tab. The Setmore plugin for Facebook cannot be accessed from the mobile Facebook app. Use a desktop or laptop to install the plugin, or use the method above. As of March 2018, due to changes in the Facebook platform rules, your business page must have 2000 or more followers in order to install custom page tabs, where the Setmore plugin resides. This was a decision made by Facebook, and as such, Setmore has no authority to change or lower the requirement. We're sorry! For the best experience, use the "Add-a-button" method, described in the previous section. 1. In Facebook, use the top search bar to search for "setmore appointments app." Make sure you select "Apps" from the filter menu, below the top nav bar. 2. Click the app in the search results to bring up the app page in Facebook. 3. 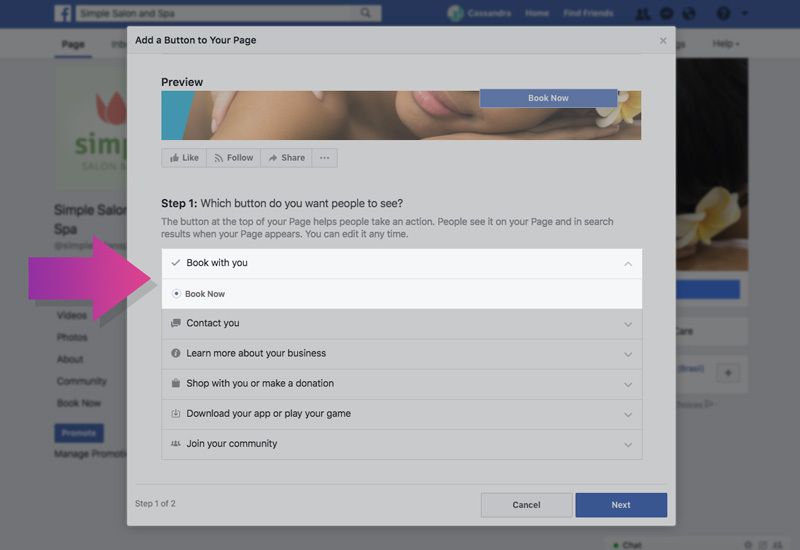 Now click the green "Start Booking from Facebook" button. 4. In the Add Page Tab menu, select your business page from the dropdown menu and click the "Add Page Tab" button. 5. You're not finished yet! Go back to your Facebook business page. Find and click the "Book Now" option in the left-hand menu. 6. You'll be prompted to enter the email address that your Setmore account is registered with. Enter your email address and click "Connect." The installation is now complete. 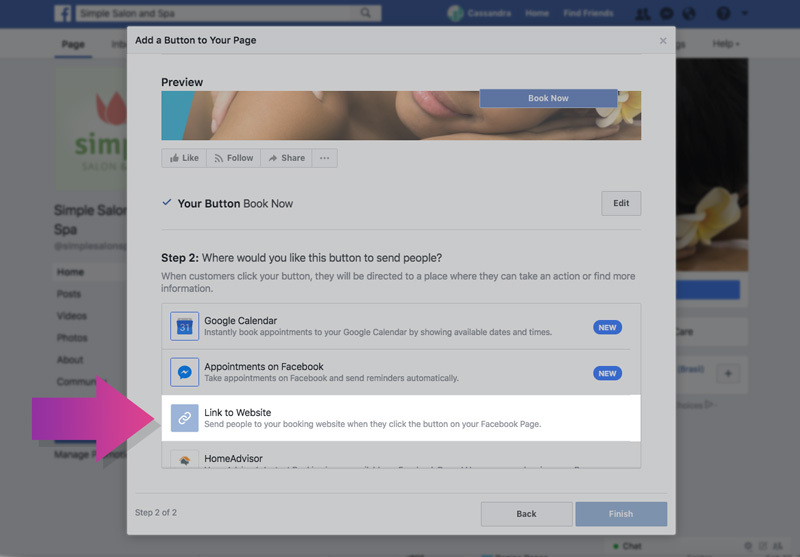 Now when customers click "Book Now" from your left-hand menu, your Setmore Booking Page will load directly on Facebook business page. Need to connect your Setmore plugin for Facebook to a different Setmore account? We can reset the plugin for you! Just email your request to help@setmore.com, or start a 1:1 chat in-app by clicking the chat bubble in the lower right corner of your account.